USS WHIDBEY ISLAND is the first ship in a class designed specifically to interface with the Navy's newest amphibious assault landing craft, the Landing Craft Air Cushion, or LCAC. WHIDBEY ISLAND further assisted in the operational and developmental testing of the LCAC from July to September 1985 and again in May and July 1986. In August 1986, WHIDBEY ISLAND embarked on her first major operation, participating in the NATO exercise Northern Wedding/Bold Guard '86. WHIDBEY ISLAND’s first major deployment was to the Mediterranean in January 1987 where the ship was involved in seven amphibious landing exercises, as well as carrying out assigned duties as Presidential support ship for the World Economic Summit held in Venice, Italy in May 1987. In February and March of 1998, WHIDBEY ISLAND conducted LCAC skirt testing in Panama City, Florida. During her most recent inter-deployment training cycle, WHIDBEY ISLAND received Direct-to-Sailors Satellite Television System and completed the IT-21 upgrade providing internet access to Sailors and Marines aboard. Currently, WHIDBEY ISLAND is deployed to the Mediterranean with the COMPHIBRON SIX and MEU(SOC) serving as MARG 3-99. 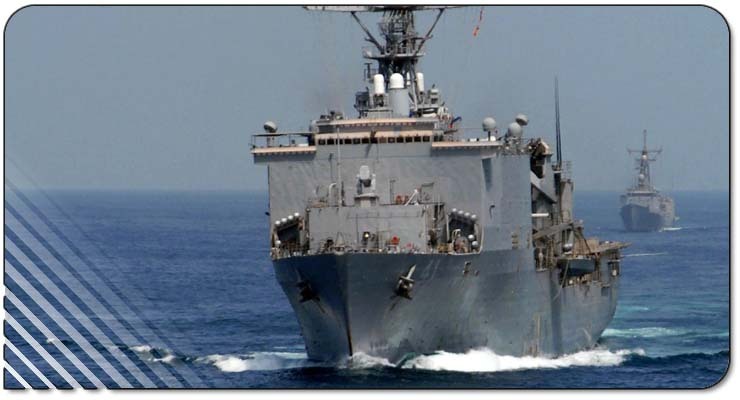 She participated in Exercise Bright Star and on October 18, with the USNS CONCORD, became the first LSD 41 class ship to conduct simultaneous connected underway replenishment for stores and fuel. On 5 December 1992 Whidbey Island deployed with MARG 1-92 representing the Amphibious Ready Group's operations in the Black Sea with a series of port calls. With members of the Sixth Fleet, the USS Inchon Band, and representatives from the other MARG ships, Whidbey Island made historic port calls to Samsun, Turkey; Constanţa, Romania; and Burgas, Bulgaria, becoming the first United States amphibious ship and the largest United States warship to operate in the Black Sea, the first U.S. Navy ship to visit Samsun in 70 years and the first U.S. Navy ship to ever visit Burgas. Whidbey Island returned to homeport on 5 June 1993. In January 1993, Whidbey Island deployed in support of Operation Sea/Signal/Able Manner, enforcing alien migration policies off the coast of Haiti. Later that year, Whidbey Island deployed to the littorals of South America and West Africa during UNITAS 34-93/WATC 93, the first Whidbey Island-class ship to deploy to this region, again making history by leading the southern-most amphibious exercise ever at Tierra del Fuego, returning from deployment 17 December 1993. In August 1994, in a Combined Joint Task Force Whidbey Island provided emergent lift services for the evacuation of 160 migrant camps from Grand Turk Island. Shortly after, Whidbey Island rescued and transported over 8,100 Cuban migrants from the Straits of Florida during Operation Able Vigil and participated in the restoration of the legitimate government to Haiti during Operation Uphold Democracy. At the turn of 1995, Whidbey Island along with Wasp (LHD-1) and Shreveport (LPD-12) participated in NATO cold weather training in the North Atlantic for Exercise Strong Resolve 95. On 28 August 1995, Whidbey Island deployed for a fifth Mediterranean Deployment with the 26th Marine Expeditionary Unit (MEU). During this deployment, the ship participated in Exercises Atlas Hinge, Odysseus 95, Noble Shirley, Bright Star and Alexander the Great, spending over three months in the Adriatic Sea in support of peacekeeping operations for the Dayton Peace Accords in the former Yugoslavia. The crew received the Armed Forces Service Medal and the NATO Medal, returning to homeport 29 February 1996. On 3 June 1996, Whidbey Island entered Norfolk Shipbuilding and Dry Dock Company (NORSHIPCO) for a Dry-docking Phased Maintenance Availability (DPMA) and received a Women at Sea Certification. On 1 July 1997, Whidbey Island departed for Unitas 38-97 setting a record for amphibious landings with several UNITAS participating nations before returning home 13 December 1997. Whidbey Island departed for its sixth Mediterranean deployment 15 September 1999. Along with 22nd Marine Expeditionary Unit, Whidbey Island participated in Exercises Bright Star, Noble Shirley and Infinite Moonlight. During these exercises the ship worked in partnership with members of the British, Egyptian and Jordanian militaries. Whidbey Island safely transited the Suez Canal as well as the Straits of Tiran, Toranto, Gibraltar, and of Messina, visiting ports such as Antalya, Turkey; Haifa, Israel; Souda Bay, Greece; and Aqaba, Jordan. On 24 May 2000, Whidbey Island returned to NORSHIPCO for multiple upgrades and additions to the ship's configuration and systems. During this PMA period the ship received two Rolling Airframe Missiles (RAM) Launchers as well as the Ship's Self Defense System (SSDS) Mk-1, significantly enhancing Whidbey Island's ability to track, engage and destroy incoming missiles at close range. On 11 June 2001, Whidbey Island completed its Basic Phase of Training and started a five week pre-deployment maintenance period. Starting 11 July 2001 the ship began its intermediate training cycle in preparation for deployment as part of Amphibious Squadron 8, Amphibious Ready Group. On 19 September 2001, just eight days after the terrorist attacks on the Pentagon and the World Trade Center, Whidbey Island weighed anchor for its seventh deployment. With troops of 26th MEU (Special Operations Capable), the ship participated in Exercise Bright Star off the coast of Egypt. At the completion of the exercise, crew and troops enjoyed a few days in the port of Marmaris, Turkey, before transiting the Suez Canal en route to the North Persian Gulf. While there Whidbey Island spent 123 consecutive days on station in support of Operation Enduring Freedom. During this operation, 26th MEU set the record for conducting the longest amphibious operation ever (distance-wise)—nearly 700 nautical miles (1300 km) inland. While deployed, Whidbey Island's crew visited Jebel Ali, United Arab Emirates; Split, Croatia; and Rota, Spain. The ship also participated in the National Training Continuum, Operations Noble Eagle, Enduring Freedom and Swift Freedom. Most importantly, every Sailor and Marine that deployed on Whidbey Island came back safely from the grueling, seven-month deployment. In June 2006, Whidbey Island deployed in support of Operation Enduring Freedom. While inport Aqaba, Jordan in July of 2006, she was recalled through the Suez Canal to support contingency operations due to the crisis in Lebanon. Whidbey Island subsequently participated in the largest Non-Combatant Evacuation conducted by the US Navy since Vietnam. During July and August, she evacuated 817 American Citizens (out of a total of 14,555 evacuated by the USS Iwo Jima Expeditionary Strike Group) via Landing Craft Air Cushion (LCAC) with Personnel Transport Module. AMCITS were taken to Limassol, Cyprus and released to State Department Control. Following operations off of Lebanon, Whidbey Island redeployed through the Suez Canal to the Fifth Fleet Operations Area and offloaded elements of the 24 MEU into Bahrain for operations in Iraq. Following the offload, Whidbey Island deployed to the Northern Persian Gulf in support of Commander Task Force 158, responsible as Afloat Forward Staging Base. In this role, she was responsible for defense of the KAAOT and ABOT oil rigs, the primary critical oil infrastructure producing revenue for Iraq. In November of 2006, Whidbey Island departed the Northern Persian Gulf and returned home, stopping in Civitavecchia, Italy and Tunis, Tunisia enroute, arriving 6 Dec, 06. On 16 February 2007, Whidbey Island was awarded the 2006 Battle "E" award. Supporters:The crossed swords of the Navy and Marine Corps Officers attest to the Navy Marine Corps teamwork and leadership that are the foundation and key elements for accomplishment of WHIDBEY ISLANDs amphibious warfare mission. The Shield: The dark blue and white colors refer to the sea, with the angular green area, representing the vergreenterrain of WHIDBEY ISLAND, backed by blue sky. The color gold is symbolic of excellence, and the ship's wheel of gold reflects the sea-going pride and professionalism of the ship's crew. 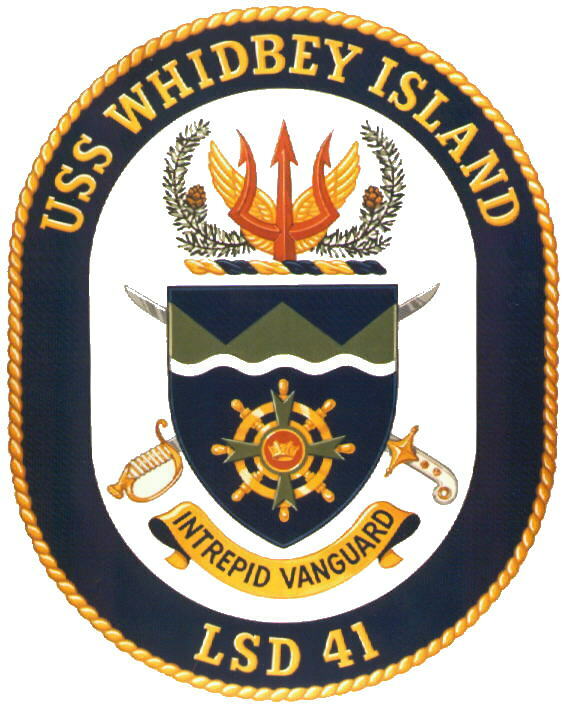 The green Maltese Cross refers to the humanitarian mission of USS WHIDBEY (AG 141), the first ship to carry the name WHIDBEY. The gold crown emblazoned on red at the center of the wheel recalls the expedition under the British Crown, which explored the Pacific Northwest in the 1790s. The island in these waters is named for Lieutenant Joseph Whidbey, who was a member of this English exploration. The Crest: The trident is the traditional symbol of sea power; however, the winged trident of LSD 41 further represents the revolutionary dimension of amphibious warfare this ship introduces. WHIDBEY ISLAND provides a quantum improvement in the projection of power ashore, with an increased capacity for vertical assault, combined with the new generation of Landing Craft Air Cushion (LCAC). Again, the gold and red colors of the winged trident portray the excellence and courage of those who will man the ship. The wreath of Western Hemlock, the State Tree of Washington, represents the spirit of the ship's namesake, which will accompany the ship to the distant quarters of the globe. Motto: Just as amphibious forces are at the forefront of the Navy, so will WHIDBEY ISLAND be in the van of the Amphibious Task Force as the leader of the high speed assault to win the tactical advantage. "INTREPID VANGUARD" embodies the fearless courage of the Sailors and Marines in service to their country on board this ship.